The earthquakes did not put any additional stress on the Cascadia Subduction Zone, where the big earthquake is expected to take place. 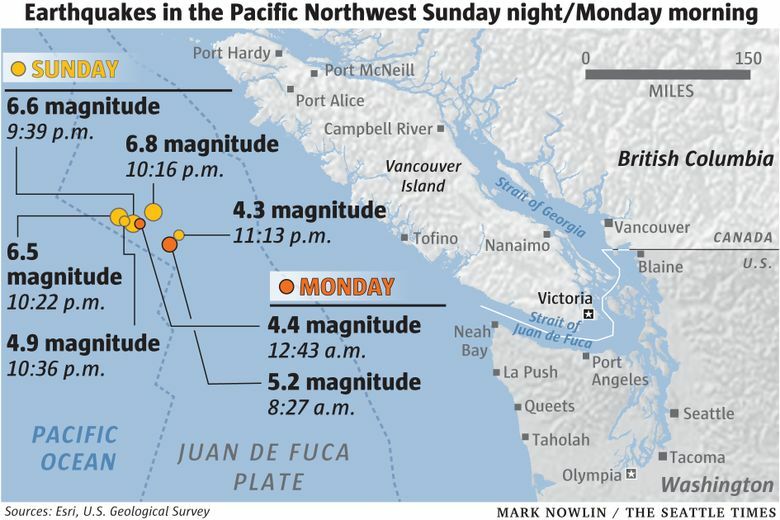 Several powerful earthquakes shook an underwater ridge off the coast of Canada Sunday night, hitting the Juan de Fuca plate that is expected to eventually cause “the big one” in the Pacific Northwest. Geologists downplayed their significance in terms of predicting when the bigger quake would occur. Four tremors were recorded within 45 minutes of one another off the coast of Vancouver Island, Canada, according to Harold Tobin, the director of the University of Washington’s Pacific Northwest Seismic Network. They started at 9:39 p.m. with a 6.6-magnitude quake, followed by a 6.8-magnitude shaking at 10:16 p.m. Tremors with magnitudes of 6.5 and 4.9 followed at 10:22 p.m. and 10:36 p.m., respectively. Several aftershocks followed. The tremors occurred at the Pacific Ocean-floor ridge that separates the Juan de Fuca Plate and its western neighbor, the Pacific Plate. But they do not necessarily signal an impending 9.0-magnitude earthquake, or a so-called “big one,” that geologists predict will hit Pacific Northwest, according to Tobin. That earthquake is expected to occur along the Cascadia fault line on the eastern side of the Juan de Fuca Plate. The largest quake was relatively shallow, at about 6 miles, and it struck about 149 miles west of Tofino, B.C. Deeper earthquakes can be felt further away from where they occur, which explains why few people in the Northwest felt Sunday’s tremors, said Don Blakeman, a geophysicist with the U.S. Geological Survey who is based in Golden, Colorado. The earthquakes did not put any additional stress on the Cascadia Subduction Zone, where the big earthquake is expected to take place. That zone lies along the fault line where tension is mounting under the earth’s crust and where cities like Seattle are located. The new tremors were recorded just on the boundary of where the fault zone is located. The National Tsunami Warning Center tweeted that a tsunami was “not expected.” The quakes were a result of the plates moving side-to-side relative to each other, as opposed to the vertical motion that tends to create tsunamis, Tobin said. Several aftershocks were recorded in the hours following the quakes, according to John Cassidy, earthquake seismologist with Natural Resources Canada. “The most likely scenario now is that the aftershocks will continue for days or weeks, but they will become smaller as time goes on, and they will become less frequent,” he said in an interview from Victoria. A number of earthquakes of that magnitude within a 45-minute window is unusual, but they don’t necessarily mean a damaging shaker is imminent, Cassidy said. British Columbia is part of the Pacific Ring of Fire, an active seismic zone, and thousands of mostly small earthquakes are recorded annually by sensors in the province.